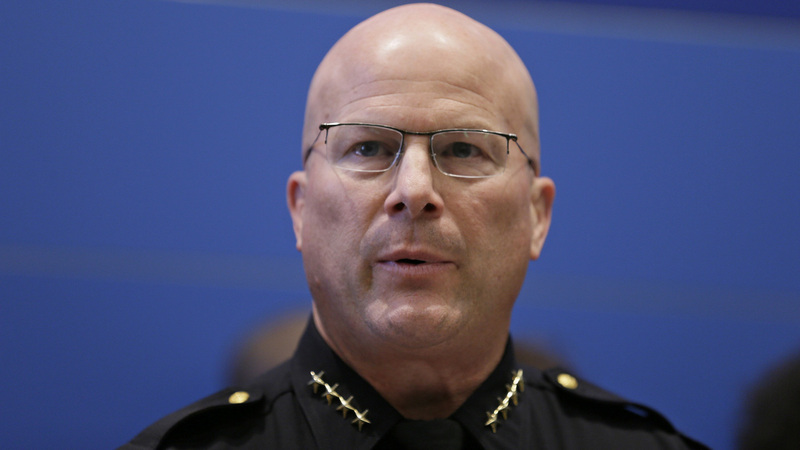 San Francisco Police Chief Greg Suhr Resigns At Mayor Ed Lee's Request : The Two-Way Suhr's resignation came after a number of racial incidents in the department. The latest happened on Thursday when an officer fatally shot a young black woman who had allegedly stolen a car. San Francisco Police Chief Greg Suhr resigned on Thursday after losing the support of Mayor Ed Lee, who had backed him despite several racially-charged incidents in the department. Protesters had been demanding for months that San Francisco Police Chief Greg Suhr be removed from office, but Mayor Ed Lee backed him despite several racially-charged incidents in the department. That support ended on Thursday when Lee ask for, and received, Suhr's resignation. The last straw appeared to have happened hours earlier when a police officer fatally shot a young black woman as he tried to arrest her for allegedly driving a stolen car that had crashed into a parked truck. That shooting happened in the same neighborhood where months earlier five officers fatally shot a young black man carrying a knife. After that shooting, and with the mayor's support, Suhr instituted reforms intended to cut down on police shootings. At the same time, federal officials were asked to review the department's protocols. But reforms were slow to take hold. As recently as last month, three officers were discovered to have exchanged racist and homophobic text messages. "I have previously expressed confidence in Chief Suhr because I know he agrees with and understands the need for reform," Lee said. "He has demonstrated his commitment to instilling these reforms into the whole department, from the command staff to the cadets." The mayor continued, "But following this morning's officer-involved shooting and my meeting with Chief Suhr this afternoon, today I have arrived at a different conclusion to the question of how best to move forward. "The progress we've made has been meaningful, but it hasn't been fast enough. Not for me, not for Greg. That's why I have asked Chief Suhr for his resignation. And in the best interest of the City he loves so much, he tendered his resignation earlier today." Lee appointed Suhr chief in 2011, a veteran of more than 30 years in the department. The Associated Press reports he rose through the ranks despite several missteps. On Thursday, Mayor Lee announce Suhr's replacement. Lee appointed Commander Toney Chaplin as acting chief. A 26-year African-American veteran of the department, the mayor said Chaplin is committed to the city's diverse communities. He has served at Mission and Taraval stations, in the Gang Task Force, and ran the homicide division. He most recently established the department's new Professional Standards and Principled Policing bureau, which focuses on transparency and accountability, the mayor said.